From Goodreads: “Enter an epic fantasy world that echoes with the thunder of muskets and the clang of steel—but where the real battle is against a subtle and sinister magic…. I loved Winter Ihernglass. She’s a strong female protagonist without being a “strong female protagonist.” Call me revolutionary, but I love it when authors write women as people. She works hard to pass for a man. She is strategically competent. She can fire a musket and wield a sword, but she never strays into the frigid automaton territory that often consumes “strong” heroines. She is also a caregiver, insecure, devoted to her friends, paranoid about blowing her cover, and trying desperately to cope with the crap life keeps throwing at her. Most importantly, she is defined by her circumstances and her actions, not by her relationships with men. Colonel Janus Vhalnich was pretty awesome, as well. I have a thing for emotionally detached, scholarly, brilliant characters, and Janus struck me as particularly Holmesian. I’d say he almost seemed to be borderline Asperger’s – hyperattentive, obsessive, with some trouble expressing his interests in ways other people can understand. I was wary of the character at first, because he came off as the setup for some deus ex machina, but my fears were unfounded, and he grew into something very, very interesting. I’d like to see passages from his perspective in future books. Lastly, I loved that, though this is the first in a series, it ended with pretty thorough closure. All the major plot points were resolved, and though the end set up the basic conflict for the next books, there’s no teeth-grindingly heinous cliffhanger. You could read it as a stand-alone. The naming conventions. They felt very arbitrary to me, as though Wexler didn’t bother to assign a set of phoneme frequencies or an orthography to each culture. The Vordanai have given names like Winter, Marcus, Jen, Janus, and Fitz, while the surnames that accompany them are Ihernglass, d’Ivoire, Alhundt, bet Vhalnich, and Warus. The Khandarai are Feor and Khtoba and Onvidaer and Jaffa. Neither set of names sounds as though it can be attributed to a single language or language family, and there was no cultural information given that could explain the disconnect. 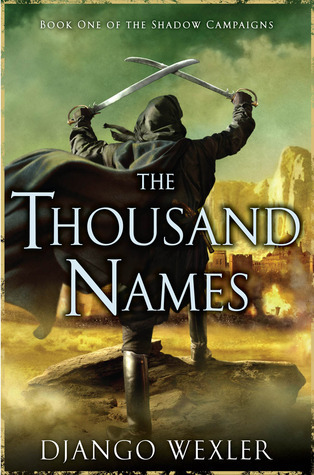 Tagged book review, Colonel Janus Vhalnich, Django Wexler, flintlock fantasy, goodreads, Marcus d’Ivoire, military fantasy, strong female protagonist, the thousand names, The Thousand Names The Shadow Campaigns. Bookmark the permalink.